Kris and I dinged over to the Atlantis Resort just after 5:00 this evening. Our new French Canadian friends had told us that we could get in for free if we went after 5, as the $35 tours would be over, but the aquarium would be left open. Acting as guests, we docked in the marina and made our way into the aquarium. We were much more impressed with the resort on this second tour. The aquarium was beautiful with an abundance of fish. 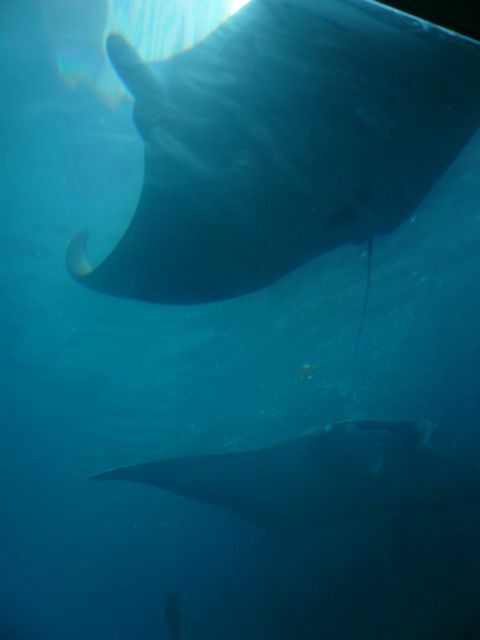 Our favorite were the two young manta rays that swam in the largest tank. I believe you could even snorkel with the manta rays! We should have brought our masks and fins. Kris and I took the opportunity to explore the rest of the resort. We stumbled upon the water park, which includes a giant wanter slide and a slow tube ride that go through a mayan temple inspired structure and into a tank filled with sharks! The trip was well worth it. If you are ever in the area, remember, go into the resort just after 5:00. Make your way through the casino and out the back door. Turn to the left and follow the paths past the tops of the aquarium tanks and eventually you will find the stairs down to the aquarium entrance. Go on in and enjoy! Watch out for the evil scuba guards! Lobsters…bet Gary wishes he could get these guys! I wonder if they are H2O intolerant? The ray comes up for a visit. Water slide and tube ride. Sharks resting on the tube.